Gal gone fishing | Guide, instructor, naturalist, nomad. Fishing is always good, but visit often to keep updated on the bite. I had a fantastic time with Doug yesterday, swinging for steelhead. The fish were very grabby and the ones we encountered were prime specimen Rogue steelhead. If you’re looking for an uncrowded river with excellent swing water, look no further. Had a great swing trip with Christian and Michael. The fall colors are just starting to emerge and the Rogue is fishing awesome. The morning started off a bit slow with a few half pounders, but as the day continued, the fishing improved. We ended up hooking up with 4 adults by the end of the day. The Rogue river has seen great numbers for steelhead returns this year. I’ve been out in the evenings for a few hours at a time and have been swinging into some nice chrome. The recent smoke from all the fires in NorCal and Oregon has finally cleared out as well, so the air quality is very much improved. September is a iconic month for swinging flies on the upper Rogue, usually fishing a leader and a traditional fly. If you’re looking for good steelhead conditions, the Rogue is where it’s at. I had an amazing time exploring BC with Dax for a few weeks. The rivers are all wild and undammed, and the fish are like any other steelhead I’ve caught in my entire life. Definetly the big leagues and land of giants for a swing angler. The scenery was also breathtaking. I’m looking at putting together a hosted trip for next fall, so please feel free to reach out with interest or questions. Had a swing trip with Kayla and Mac from Fish First Fly Shop in Chico on Saturday. It was a cold and blustery day, and the river was on the rise, but we still had of fun on the water. We focused on spey casting techniques and reading water. Kayla also caught her first Trinty river steelhead. I think her smile says it all. Spent a great month on the Grande Ronde river at Speywater Lodge. The fishing conditions were tough due to low fish returns and an abundance of precipitation, but overall the experience was incredible. It is a gorgeous river and the steelhead we did swing up were feisty. A typical day for this year was one or two fish a day. It was a good mix of hatchery and wild steelhead. The food was excellent as well. I can’t wait to go back next year. Book your spot here. This past Labor Day weekend, I had the pleasure of hosting a trip with Travis Johnson and his company All Waters Angling. We floated and camped on the Lower Deschutes river. This river is regulated for bank fishing only, which meant fishing from the boat was not an option. No problem here! With the big water and bouldery riffles, spey casting is by far the most effective way to fish this water; not to mention the most fun. Travis is the world record holder for spey casting and an excellent guide and instructor. The river conditions were excellent. With Travis’ help and that of fellow guide Caleb Lockyer, everyone was able to improve their spey casting, learn more about the river, and have some fishy encounters. Not to mention excellent cuisine and lots of laughs. I know I’m already looking forward to next year! Dave was a first time spey caster, his casting progressed so much through out the week! 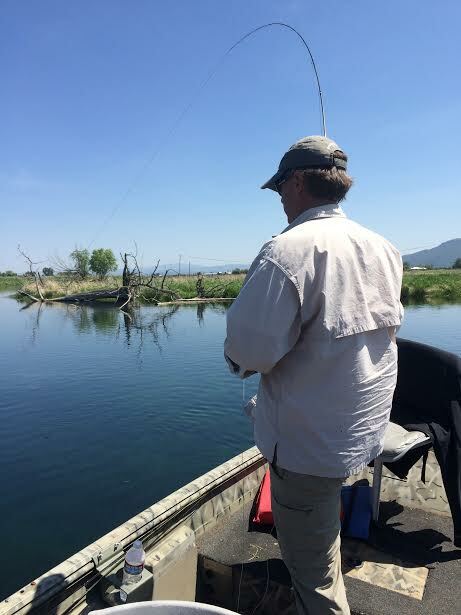 Even I got to fish a little…..
Beautiful scenery is also included. Zach with another fish on. The past few weeks have been hot with tough conditions on Fall River. However the past week has seen an increase in fishing productivity due to the cloud cover, cooler temperatures, and afternoon showers. Sinking lines with sparse streamers are superb, and the fish are on the nymph grab once again. Not as much dry fly action during the day as would be expected with the overcast skies, but the Hexagenia hatch is happening in the evenings. 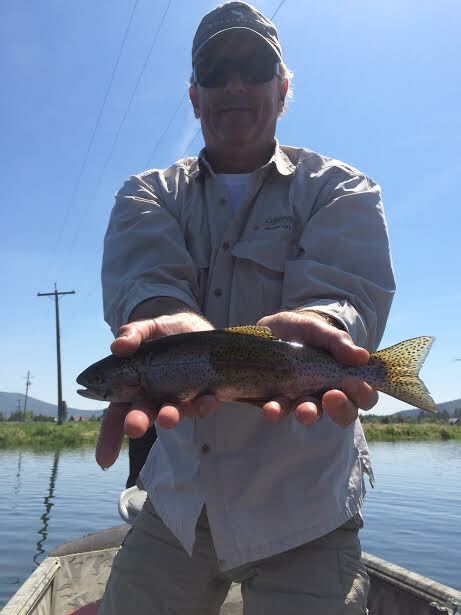 The hatch has moved to parts of the upper river, and evenings are consistently producing nice fish. There have been a variety of sizes hatching; if you aren’t getting grabs on the bigger dries, try tying on one a size smaller. For those of you venturing out on your own, it can get crowded out there and with the thunderheads it’s dark coming back to the dock. Please remember to bring boat lights, a spot light, and your sense of propriety and courtesy when you’re enjoying the river. I recently took a trip to majestic Utah with my raft in tow and floated and camped my way down the Green River near Flaming Gorge. I love the scenery on this river. It is absolutely breathtaking with red cliff canyon views, gin clear water, and lots of fish. Not sure if it was the cicada hatch that brought all the sports to the river, but the river was extremely crowded. At any given moment on the A section, you could look up and count 14 boats in one half mile stretch of water. And I thought the Trinity could get crowded! Despite an enormous amount of pressure and crowds on the A section of the river, the fishing was still great with proper rigging, line control and a good reach cast. The cicada hatch was popping in the morning with fish hitting big bugs on top, but by mid afternoon, the fish were eating sub surface. Sight casting streamers to fish hanging near the bank was very effective and it was nice to pull over and let the crowds drift by. This trout ate a streamer and gave a serious fight! We camped at Big Pine II campground (float in access only) on the beginning of the B section, and this part of the river was much less crowded. Fish in this section were much grabbier, and you could tell they had seen quite a few less flies recently. Less dry fly action (this could have been the stormy weather and less of a hatch), but they were eating nymphs very consistently. In the slower water, a spring creek nymph rig caught fish almost every cast. Bellow red creek the river was murkier, and the streamer bite in this section of the river was insane. Some of the best streamer fishing I have encountered. The camp/float section of the trip was a huge success. Chilling the scotch to perfect temperature. A fish caught right on the camp waters. Up in Wyoming, the fishing on the Green was also great. Despite a recent increase in flows, the fishing bellow Fontanelle Reservoir was excellent. I brought my spey rod and swung streamers with quite a few grabs. There was even an epic thunderstorm late in the afternoon that kept things interesting. Nothing like brandishing about a 13′ metal composite rod in the midst of a electric storm…. The past holiday weekend was quite busy on most local streams and rivers, but the fish were happy and ate quite willingly. Fall river fished well on a nymph, and there was also opportunities to catch wild rainbows on a dry fly. The evenings produced beautiful thunderheads, but we were spared rain. However, the clouds did make for some beautiful sunsets. Morning on Hat Creek produced a good number of fish slurping at a trico spinner fall. A downstream presentation works best for these fish, with the trusty “Hat Creek skate” to get the fly/flies into the proper lane where fish are consistently rising. Fall River sunsets are the best! Spring creek fishing at its finest. Fantastic fishing on Fall River today. My client Peter had a double digit day and got a Fall River grand slam. He hooked and landed fish on dries, nymphs and streamers. Early in the day, fishing a nymph rig was effective and he landed both large and small fish. The afternoon brought some wind, but it died down after and hour or so, and there was a solid PMD hatch. It seemed like almost every drift rose a fish, and he even hooked a fish in the 20″ range. Later in the afternoon, the hatch was over and we switched over to streamers and nymphs again, which produced quite a few hook ups. Smiles all around, life is good. Headed out to catch the evening bite on the riffle. Dark brown caddis and yellow sallies were hatching in abundance. I even saw a few salmon flies helicoptering around in the mix. The fish were mainly targeting the emerging caddis, and I landed an epic brown and a classic hat creek rainbow, both on dries. Not too shabby for a half hour sun downer session. The fish were on the job today chowing nymphs on almost every cast in certain runs. A light, spring creek nymphing rig was the way to go. Fish were aggressively eating small pheasant tails and micro mayflies. The dry fly action was a bit slow, with occasional rises, but nothing consistent. Small baetis dries produced a few opportunities early in the day, and PMD’s were hatching around mid day with fish sporadically rising to feed. The streamer bite was fair with a few opportunities using sparse leech patterns. in Maupin. tight lines. loved the article. salmon fly hatch on Deschutes should be going off early this year. love the spey. congrats on the competitive endeavors. I would like to discuss techniques used in sea fishing. we can do fishing easily through rods. we spend lots of time in sea shore in catching a fish. It’s a good sport in sea shore. I would like to discuss this thanks for the info.